The BioPac'r is a new innovative approach to handling green waste. The BioPac'r is compresses grass clippings into a bale that is then packaged inside our customized 1-ton Pac'r Bag where the biomass can Ensile into Grass Clipping Silage™ that is safely fed to livestock. 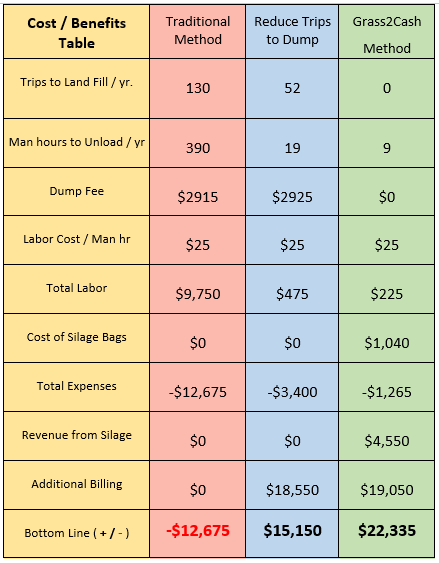 You still Pay the Labor Expense on Every single Trip, wasting time & resources while causing landfills to shut down because they have reached their capacity prematurely. Bypass Landfills or Smelly Compost Piles by Saving Time & Labor While Creating a New Revenue Stream with the BioPac'r™ Grass Clipping Packaging system. We will help you market & sell your Grass Clipping Silage™ and even set up the delivery of your new feed to one of your local Farmers. You just sit back and wait for your silage check. The Cost / Benefits Table below demonstrated the economics of handling grass clippings three different ways. This field trial was conducted over 3 years by several very reputable lawn maintenance companies. For any business owner, the return-on-investment (ROI) question is one that you need to ask every time you are conciser buying a new piece of equipment. We hope to offer a new calculator designed for landscapers, solid wast operators, sod growers and golf course to answer the most important question, "How does this new equipment impact my bottom line?" The clippings are tossed into a pickup or trailer as lawns are mowed. At the end of the day or early the next morning (Peak Hours), workers take the clippings to the landfill where they wait in line to be weighted, next you wait in line to back up to the grass clipping pile where clippings are kicked, scooped or dumped out. Then you find yourself waiting in line again to get back on the scale where you finally pay your dump fee...every day, every week! The clippings are dropped into the BioPac’r that can either be mounted into the back of a pickup or on your equipment trailer. It is now possible to bypass the dump for a few days reducing the daily trips and man hours until you go to the dump and unload in a few minutes because now one man can go by themselves during Non-Peak hours, No Lines and No Waiting. You still pay the dump fee but throughout the week, you can now bill out an extra hour or more each day that you don’t have to go to the dump. The clippings are thrown into the BioPac’r™ and at the end of the day you spend 5 minutes packaging the compressed bale into a silage bag and in 30 days it is worth almost $90/ton. YCC will help you market & sell your Lawn Clipping Silage and even set up the delivery of your commodity to a local Farmer, Dairy, Feedlot, etc.